TRY AS MANY RESTAURANTS AS I CAN! I tried to eat at a different restaurant each night. Touristy Restaurants, Must Try Restaurants, Candy & BBQ, and Lunch Time Places. So here are shorter reviews on some of the most touristy spots in New Orleans. On my first weekend in New Orleans, I went on a search for a great bar for the Sunday football games. I wanted somewhere touristy so that I could mingle with other out-of-towners, talk some football, and stuff myself with local eats. Acme Oyster House was an easy decision. Here, I decided to order several dishes at different times during the game. This way I could drink plenty of Abita (local) beers and still have room for their food. I started with a dozen raw oysters on the half shell, followed by a half dozen char-grilled oysters, and topped off my stomach with a combination fried oyster-fried shrimp po' boy. I figured if I wanted oysters I should go to a well-known, reputable restaurant and that is exactly what Acme is. The oysters were the freshest I have ever had with the oysters being shucked at the bar. No lemon or cocktail sauce is needed. The char-grilled oysters were incredible. They were topped with a little parmesan cheese and bread crumbs and of course plenty of butter. Dip the bread into those and you are in heaven. Finally, was the po' boy. This was tasty, but as my trip progressed and I tried several other po' boy places, I realized that Acme's is just average. They don't skimp on fillings, but they do lack in flavor and reasonable cost. The touristy aspect of this restaurant is nice, but with a line waiting even at 11AM in the morning and much better food at the local eateries, I probably won't be back. And, for that reason, only a 3-mile average rating was given. One word that is associated immediately with New Orleans is beignets. And, everyone knows there is one place to go. Cafe du Monde is that place. Located near the river, make sure to find the actual Cafe du Monde and not one of the imitators. Once you arrive, either wait in the line to be seated, unless it is seat yourself time, in which you must stalk tables until one opens up. If you don't want to wait for a table, then try the take-out line in the back. When it was time to order, I decided on an order of beignets and an iced cafe au lait. One order comes with three beignets showered in powder sugar. The cafe au lait is made with their famous chicory coffee. The beignets are out of this world. Freshly fried, not oily, and just enough sweetness from the powdered sugar to satisfy your dessert cravings. I highly suggest ordering some type of coffee drink because it helps break up the idea you have three of those rich beignets to eat. I wish this place wasn't touristy because I would go back each day. It takes some time to find a spot, but it is well worth it. A 5-mile rating was a no-brainer. After several recommendations to try Cafe Maspero, I decided to give it a try towards the end of my stay in NOLA. It was a little bit of walk through the French Quarter, but I arrived for an early dinner on a weekday... so basically I arrived to an empty restaurant with very lazy staff. The menu seemed like classic New Orleans bar food so I stuck with the jambalaya appetizer and the Muffaletta sandwich. The jambalaya is made with shrimp, smoked and hot sausage, chicken, vegetables, and of course that standard rice and spices. The Muffaletta is a huge sandwich which starts with a seeded italian roll generously stuffed with ham, salami, pastrami, swiss cheese, and the classic olive salad. Overall, the food was just average. The jambalaya had great spice and had huge chunks of meat and whole shrimp, but it was served with a stale piece of garlic bread, which made the entire dish taste somewhat older than it should be. The muffaletta was the highlight of the meal with plenty of meat and a wonderful olive spread. The meat to bread ratio is insane so don't order if you aren't a huge meat head. It came with steak fries and was definitely big enough to split. I couldn't believe I ordered both dishes. The prices are extremely fair and are more on the very affordable spectrum, especially for being in the French Quarter. Unfortunately, I couldn't look past the terrible service and the average food so I stuck with a 2.5 mile rating with this restaurant. To the tourists that are in New Orleans for only a couple of days, this restaurant was made for you. Located in the French Quarter, the Court of Two Sisters is a somewhat affordable buffet featuring almost all of the local specialities. From turtle soup to jambalaya to even bananas foster. I decided coming here for lunch, which is significantly cheaper than dinner. Still, at nearly $30.00 per person, you need to have a big appetite to make it worth it. For me, one or two overflowing plates wasn't enough, so I made sure to save room for that fourth plate. Some of the highlights of the buffet included boiled shrimp, plenty of salad options, a sweet spin on corn bread, a made-to-order seafood omelet, turtle soup with sherry, a carved meat section, crawfish étouffée, bananas foster with vanilla ice cream, and much more. I honestly couldn't write or even remember half of the dishes. I was pretty impressed with the quality of the food. The carving station was delicious and the fact that they had a made-to-order egg station was unbelievable. I fell in love with two dishes in particular. The first was the duck. It had a sweet glaze and was extremely tender. The second was without question the bananas foster. I know it was flambeed in front of me, but an unlimited supply of bananas foster and vanilla ice cream is much better than fire. Like I said, it is a little pricey, but with live music and plenty of options, I decided on a 4-mile rating for tourists... a 3-mile for locals. Before arriving in New Orleans, I had several opportunities to try po' boy sandwiches in Chicago. And, after a quick search, I found that Mother's Restaurant is one of the oldest, most well-known po' boy sandwich restaurants in New Orleans. After waiting in a line that averages 20-25 minutes, you finally walk into a restaurant to be greeted by several small tables, a larger back dining hall, and another line to the cashier. I wanted to try as much as possible so I didn't have to wait in that line again, so I ordered the Famous Ferdi Special Po' Boy and a side of their red beans and rice. The po' boy is made with Mother's best baked ham, roast beef, debris, and gravy. It comes with shredded cabbage, pickle, mayo, and a creole and a yellow mustard. The po' boy was extremely messy, but that "gravy" aka au jus was packed with salty goodness. And, the debris was essentially the juice, drippings, and a few pieces of shredded beef that comes from the roast beef cooking process. I was a little disappointed with the size of the sandwich. I ate it without any difficulty and would have been hungry if it wasn't for the red beans and rice. The beans and rice was standard, nothing that made it stand out. Honestly, I enjoyed the hospital red beans and rice more. This old establishment is synonymous with po' boy so I guess it is a must-try. But just remember, a 3.5 mile rating on my blog means there are definitely better po' boys out there (my opinion). The French Market is a huge tourist spot where people can buy anything from souvenir voodoo dolls to alligator jerky to even full cooked meals. With over a dozen stalls, it is difficult to pick and choose one to eat at. I searched long and hard for a place that served boudin balls and this was the only one that I found (in the French Market that is). 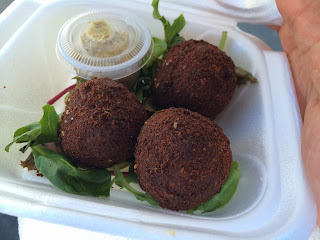 Boudin balls are the famous New Orleans rice sausage that is formed into balls, breaded, and deep fried. It was served with a whole grain mustard. I was pretty disappointed with my first experience with this appetizer-type dish. In my opinion, this dish was overcooked and actually appeared burnt. I couldn't really taste much except for oil and that mustard. Luckily, I was able to try boudin balls from a more established restaurant later in my trip. I definitely do not recommend coming here for food either. There are better places in the French Market and around the French Quarter neighborhood. I don't feel comfortable rating this place because the owner didn't charge me for my meal probably because they meal seemed inedible. Seafood is a staple of New Orleans cooking. Everywhere serves fresh crawfish, crabs, shrimp, fish, and much more. What I love was their different ways on how to prepare fresh seafood. As seen on TV, Deanie's Seafood is famous for their deep fried platters and their barbeque shrimp. Unfortunately, both are quite expensive. So, in order to try both, I went during lunch time. I couldn't order the seafood platter for two so instead I decided on the Crawfish Duo and the Barbeque Shrimp appetizer. The crawfish duo came with both crawfish étouffée and fried crawfish tails and the appetizer was just a smaller portion of their barbeque shrimp. All I can remember from this restaurant is how DISAPPOINTED I was. The meal was absolutely awful. First, they give you potatoes from a "seafood boil" despite not having any fresh crabs on site, except shrimp. These potatoes were somewhat seasoned, but just made me sick. Then the appetizer shrimp came out. The sauce was straight up oil with heavy seasonings. The flavor was delicious and shrimp solid size, but too much oil for my liking. It came with a freshly baked bread roll, which didn't even impress me because why would I dip it in that "sauce." I was hoping the crawfish duo was a better choice, but then encountered deep fried crawfish tails that tasted only like the breading it was batter in. The fries were better. I think the best part of the meal was the étouffée which is still poor quality when compared to the other restaurants I tried. I will never go back to this restaurant and would never recommend it anyone. My advice, stay away from this 0.5-mile rated restaurant.